Yesterday there was a lot of twittering, chirping and chattering within the CMBO flocks about a possible change in weather which would *hopefully* bring in migrating avian species more interesting than the Mute Swans at the Hawk Watch. This chatter got my little lepidopteran antennae perked as winds good for birds are winds good for butterflies! So Tori and I kept tabs on the weather for the NorthWesterly winds of change. There was surely some promise delivered on the winds last night for birders today, with yellow warblers, shorebirds and a frigatebird to boot! (I can say this with confidence thanks to Michael O'Brien, who was kind enough to allow us butterfly folk to join him on a bird hunt at the Cape May State Park). Although this isn't a post about birds, it seems they are the only thing this monarch monitor really got to see today. It was another disappointing bust for monarchs, with a grand total of 2 for the whole day, bringing our 9 day total to 66, or 5.86 monarchs per hour. The day started out overcast and misty, but by the afternoon census run, there were clear skies, which Tori and I hoped would bring out our Orange and Black winged friends! But we saw 4 cabbage whites, 2 black swallowtails, 1 summer azure, 1 orange sulphur, 1 common buckeye, 1 fiery skipper, 1 pearl crescent and 2 monarchs total (plus birds and very active dragonflies). Tonight weather.com predicts some SSW weather overnight with WSW weather for tomorrow. Maybe there will be a little pixie dust spread across the cape and I'll awaken to a bit of orange magic in the morning. 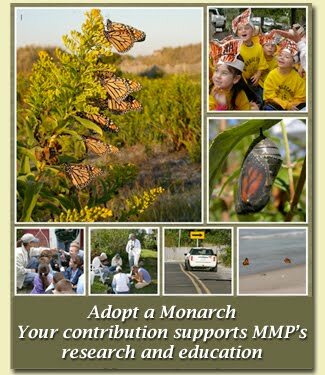 I haven't given up hope, but I'm just putting it out there, for all the monarchs to read: COME TO CAPE MAY! Do you notice the 'cat eyes' on the forewings? It's black and orange, but no Monarch! Week 4 ! We Want More! Monarchs!! The 2011 Monarch Season has Begun!